It's the Crochet Sampler Afghan by Marianne Forrestal. It has 12 different blocks, plus a border. 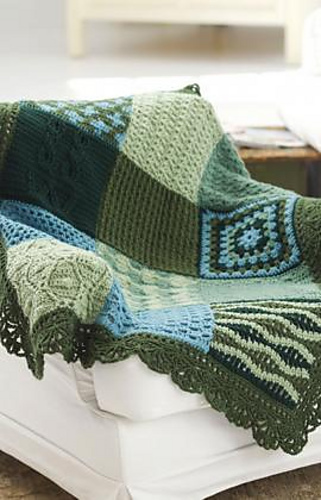 Once you make all the squares, you block them, seam them up, and crochet the border around. It's just a block a month, and they take hardly any time at all. The pattern is free, the class is $10 and that includes the yarn! You get an hour of help from me, and in an hour, you can easily do a whole square. At least, I've done 2 squares in an hour (each) and so some of them can be completed. 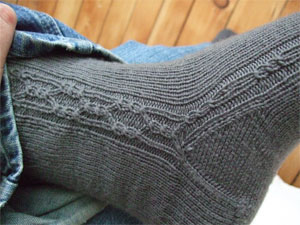 I also completed the second sock of the second set of Hermione's Everyday Socks. It's Shibui Knits in Charcoal. Not exactly as exciting as the MadelineTosh, but it's turning out lovely already. As a matter of fact, it kind of makes me want a pair. Maybe after Christmas is all done. It's not just knitting and crocheting that I've been working on either. We've been looking into some new possibilities for our business. It's definitely slow-going, but changes are needed, and sometimes it's difficult to turn the Titanic. So, little by little, things are looking up.